This means anything we could hunt or find – meats, fish, nuts, leafy greens, regional veggies, and seeds. Sorry, the pasta, cereal, and candy will have to go! Instead, you’ll be making things like chicken stir fry and paleo spaghetti. Taking gluten out of the occasion! I've been trying to eat this way more. It's not because I'm gluten intolerant, but I feel so much better. It's fun to shake it up. Instead of baked potatoes, try doing recipes with Sweet Potatoes. They are naturally gluten free and delicious! It's amazing how many wonderful recipes there are online to try! You may like them even better. Have you ever heard the saying that the best items in the grocery store for your body are on the outside aisles! Everything in the middle is bad! Tonight, I'm doing a paleo shepards pie for dinner. It smells divine! Here's the recipe. In a large skillet, brown the meat with the cloves of garlic in butter. Pour the meat mixture into a large baking dish-- 9X13" works well. 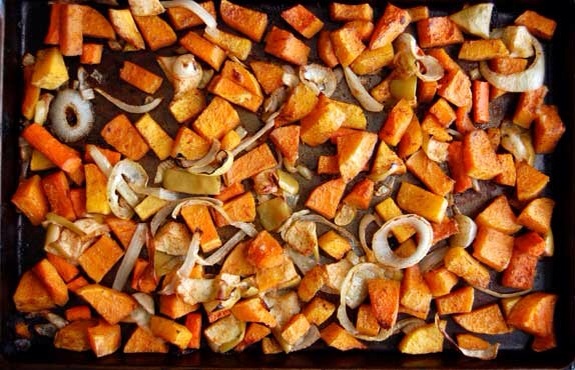 Bake your sweet potatoes: place the sweet potatoes on a foiled lined baking sheet and bake until soft-- about 40 minutes depending on the size of your sweet potatoes. (You could also do this step while you are cooking the meat on the stove top). Allow the potatoes to cool for a few minutes, then peel and place into a medium-sized bowl with coconut milk, butter, sea salt and pepper. Bake the shepherd's pie for 15 to 20 minutes, or until the sides are bubbling and the center is hot. Heres an alternate recipe to try if you want something lighter. Here's butternut squash soup! It's a fall favorite!